Ken Choo Wai Kien from INTI International University has been selected as one of four students to attend and anchor an exclusive broadcast of the Clinton Global Initiative (CGI) Annual Meeting in New York. 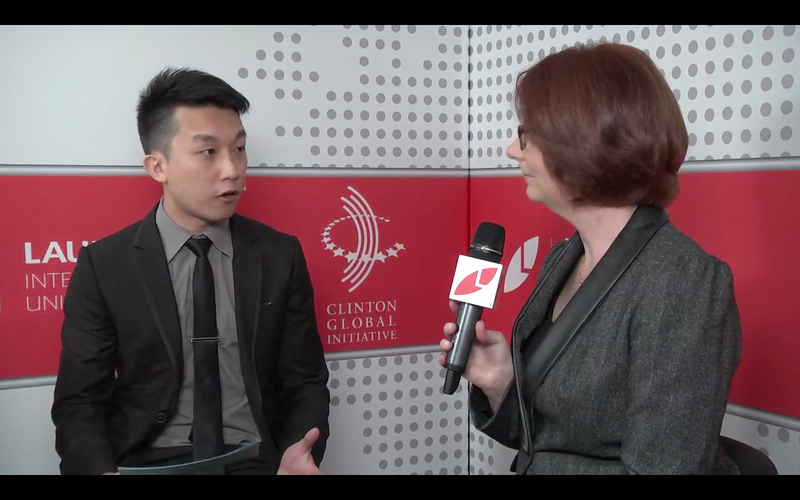 During the event – themed “Mobilizing for Impact” – Ken Choo Wai Kien had the opportunity to interview several CGI attendees, including Julia Gillard, the first female Prime Minister of Australia and civil rights activist Reverend Jesse Jackson. He also had the opportunity to meet Sheryl Sandberg, chief operating officer of Facebook and author of The New York Times’ best-selling book “Lean In,” and Chelsea Clinton, member of the Clinton Foundation’s Board of Directors. Ken Choo interviewing Julia Gillard, former Prime Minister of Australia, at CGI in New York. The Clinton Global Initiative was established by President Bill Clinton, 42nd president of the United States and honorary chancellor of Laureate International Universities, the world’s leading network of higher education institutions. CGI is a forum for government, business and philanthropic leaders to discuss solutions to the world’s biggest challenges. This is the second consecutive year Laureate will exclusively broadcast CGI’s annual meeting. This year’s event will be broadcast in English, Spanish and Portuguese to more than 45,000 Laureate students around the world. Ken was selected from a pool of high-achieving applicants from Laureate institutions, based on his proven interest in journalism, and commitment to improving communities around the world. Ken is a final year Bachelor of Physiotherapy student at INTI International University. Ken, who hails from Kuala Lumpur, has a strong passion and interest in communications and helping the underprivileged. He regularly offers his services as an emcee and event organizer, and also volunteers for the various CSR activities undertaken by the University’s student body INTIMA. “We are proud to have Ken represent INTI International University and Malaysia at the CGI 2013 in New York. This is an opportunity of a lifetime as he interviewed some of the biggest game-changers in social and community development and heard from inspiring leaders such as President Barack Obama, rock star and philanthropist Bono, and Archbishop Desmond Tutu among others. His peers across the INTI network meanwhile, will have access to an exclusive broadcast of the proceedings in New York. This event is among the many platforms we offer our students to motivate and encourage them to go beyond the classroom in their pursuit of excellence,” interim Vice-Chancellor of INTI International University Dr Allan Fisher said.